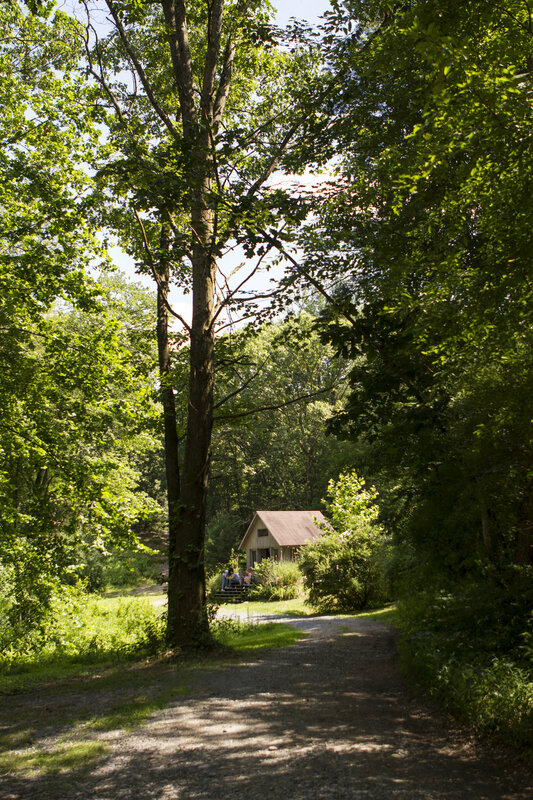 Situated in a lush stand of trees in Montague Township, New Jersey, about two hours from Manhattan, is Tamerlaine Farm Animal Sanctuary, home to nearly two-hundred chickens, turkeys, goats, ducks, pigs, and other nonhuman animals rescued from a variety of exploitative industries, but mostly from those that supply meat and eggs to American consumers. In stark contrast to the squalor, abuse, and confinement from which many of them were rescued, at Tamerlaine, these animals enjoy the freedom to move about, socialize, play, and express their individuality. But Tamerlaine isn't just a sanctuary for animals: it's also a haven for people who love them, as I found out on a recent trip to Tamerlaine, organized by the good folks at Animal Connection. Last Sunday morning, I boarded a bus in Midtown Manhattan and, along with about seventy other animal-loving New Yorkers, made the trip to Montague Township to visit Tamerlaine; enjoy the company of its resident goats, chickens, turkeys, and pigs; and, eat as many vegan empanadas as I could without making the other guests uncomfortable or causing the pigs to feel inadequate. Located on several beautiful and well-maintained acres, Tamerlaine is a serene, peaceful refuge. This is Bubblegum, one of several goats rescued from a "Farm to Table" operation in Westfield, Massachusetts. Many people who consider themselves "conscientious omnivores" make a point of avoiding meat that comes from factory farms, and consume only meat that is the product of small-scale farming operations that market themselves as healthy, sustainable, and ethical alternatives to factory farms. The truth, however, is that as far as the well-being of the animals is concerned, many of these farms are just as bad as, and often worse than, factory farms. When the goats who now live at Tamerlaine were rescued, many of them were sick, all were emaciated, and the farm on which they were being raised was strewn with the decaying bodies of other animals who had died from neglect, disease, and starvation. This is Merci. She's one of several turkeys at Tamerlaine who was rescued from the meat trade. In commercial turkey-farming operations, which are concerned primarily with maximizing profits per square foot of space, turkeys are routinely mutilated, crammed together in huge windowless sheds, and killed when they are between five and six months old. In their natural habitat, turkeys can live to be ten years old, so turkeys raised for meat are slaughtered when they have reached only a fraction of their natural age. At Tamerlaine and other reputable sanctuaries, these gentle birds receive all the veterinary care they need, plenty of space, and lots of TLC. This is Artie. He's a potbelly pig who used to be someone's pet. When he failed to stop growing, he was given up by his guardians and he now lives an incredibly contented life with ample space to root around and no shortage of eager human hands to administer (pot)belly-rubs. Most pigs aren't as lucky as Artie, however. In the United States alone, 115,000,000 pigs are slaughtered annually for food. Untold tens of thousands more die from disease and stress before ever reaching the slaughterhouse, and their bodies are often simply ground up and fed to other pigs. This is Jacob, a Cornish rooster. Of all the terrestrial animals bred, raised, and slaughtered for food in the United States and around the world, the chicken is by far the most exploited and abused. According to United Poultry Concerns, chickens and turkeys constitute 99% of all land animals raised and slaughtered for food in the United States, and upwards of nine-billion chickens are slaughtered every year in the U.S. alone. Chickens raised for meat are typically killed when they are between twenty-eight and forty-one days old, but in their natural habitats, chickens can live for up to fifteen years. The chickens at Tamerlaine are beautiful examples of how well these intelligent animals can thrive when they are given adequate space, proper care, and the ability to establish and live within a natural social structure. The holes in Bubblegum's ears are vestiges of his former life on a "Farm to Table" operation and reminders of the status of all animals bred and raised for food: that of a commodity. It is customary throughout the animal farming industry to tag or otherwise mutilate the ears of animals such as cows, goats, and pigs, for easy identification and to allow farmers to determine at a glance who is ready to be shipped to slaughter. This is Fawn. Her ear tags were removed, and she is now happy and healthy, but she still bears the scars left by those who bred her into existence for the sole purpose of profiting off of her dismembered body. If you live in the New York/New Jersey area, I encourage you to pay a visit to Tamerlaine Farm Animal Sanctuary, where you can meet some of these amazing animals in person. Please also consider supporting the work they do by either making a donation, or by purchasing some of their merchandise. If you live outside the NY/NJ area, please consult Vegan.com's farm animal sanctuary directory, which, though not 100% comprehensive, is still an excellent resource for anyone interested in visiting or supporting a sanctuary.